This pedal has no frills, bells or whistles but I love it. So it doesn't have attack or release features, I've tried others that have, I always come back to this pedal only because I find I can get by very simply without the those features. Sometimes simplicity is enough,like less is more! It does do what it's supposed to, Great for slap. Gives my Jazz basses a little extra smidgen of smooth growl on finger style!!! or is it me, can't explain it, Do use the enhance knob sparingly. I go no further than 9 o'clock. I have never had a problem with hissing. I traded this one in on a higher quality compressor. A bit noisy. For the money it does a fair job. I bought this about a year ago. It has the rugged Boss construction and the features are Ok. The Ratio and Threshold work to produce a very subtle type of compression. If you are looking for a very pronounced squash I'd look elsewhere. I believe the enhance knob is supposed to enhance the treble but I've found that it only produces an extremely annoying hiss and the pedal would be better without it. Lastly, I've found that the LMB-3 doesn't get along that well with other pedals on the pedal board. Level, ratio and threshhold dials work just as intended, and with a range from 1:1 to ∞:1 sound "squashing" ratio, you can limit the sound spikes perfectly. 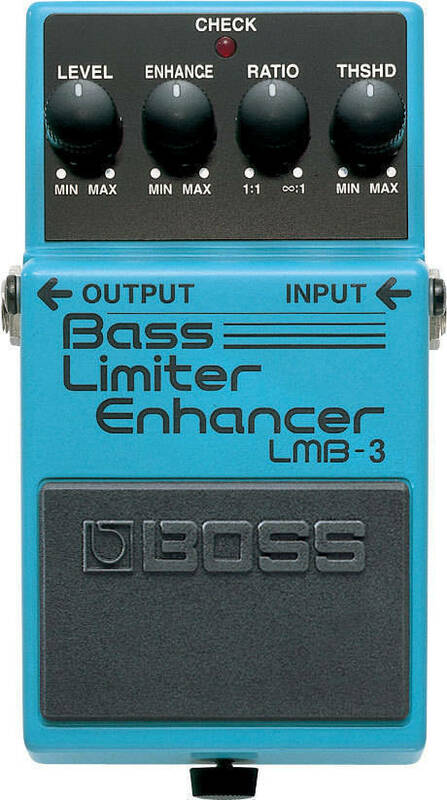 The only problem with this pedal is the "enhance" knob. It's meant to boost the treble, ie. your highs, but since noise is typically in this frequency range, turning the knob beyond the MIN setting basically acts as a noise enhancer. Probably only useful if you have a noise gate as well? Otherwise, the pedal is great.